紫姑神 The shade of the purple dame. 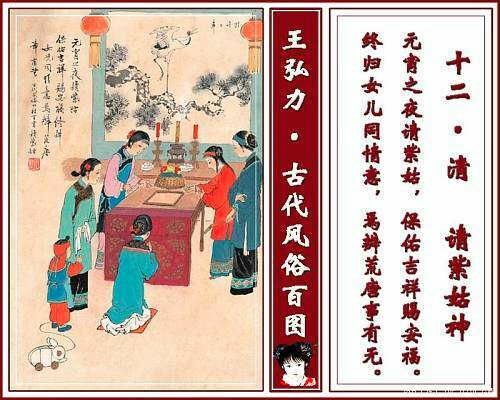 In a work called 異苑 E-yuen, it is said, that "The legend of the 紫姑神 shade of the purple dame, is as follows : This person was a concubine in a certain family, and the principal wife being very jealous of her, frequently set her about the dirtiest drudgery; until, on the 15th day of the first moon, from grief and vexation she died. Hence the common people on the anniversary of that day, have been in the habit of making an image of the lady, and going by night to greet her in the water-closet." What they prayed are as this: "Your husband is not at home, Ms. Cao has been back to her parents. Zi-gu you can come out now." Ms Cao was the proper wife who pressed her so much and caused her death, people though Zi-gu are still scared of her. 李商隱 Le-shang-yin says in his ode : "Yesterday 紫姑神 the shade of the purple dame departed ; and to-day 青鳥使 the messenger of the green bird slowly comes."